The Rooftop Communication Kit is a convenient bundle enabling simple, fast integration with SMA Sunny Boys on site. Module-based data is transmitted wirelessly across the rooftop from the TS4-R units to the Gateway, which is connected via RS485 to the Cloud Connect Advanced (CCA). 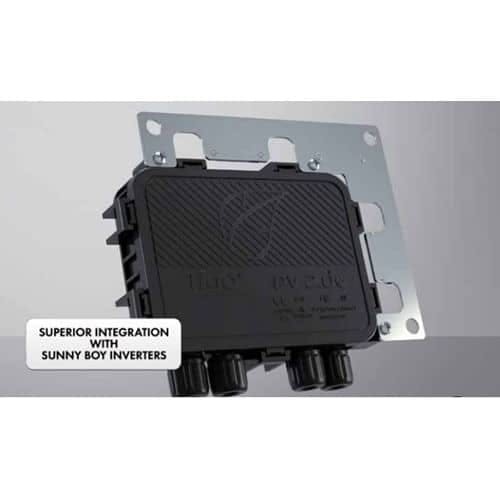 The Cloud Connect Advanced is installed in the connection area of SMA’s newest Sunny Boy inverters and eliminates the need for external enclosures. View performance data on the Sunny Portal — the world’s largest PV monitoring repository. Both the Gateway and Cloud Connect Advanced are included with the Rooftop Communications Kit (ROOFCOMMKIT-P1-US.) Only compatible with SMA SBX.X-1SP-US-40 inverters. Use with TS4-R Add-on-Module & -40 SMA Inverters.